Spend 7 days immersing yourself in a life style that can change everything. DETOX, RECHARGE, LEARN AND APPLY A NEW WAY TO LIVE YOUR LIFE. Offered at various locations in southern California and worldwide. Most workshops have PMA CEC’s offered.If you are a studio interested in hosting Niedra please please contact us. 6 week coaching program $1497.00. Online (or in-person) private coaching. New Workshop by Niedra Gabriel! My new workshop has launched at FusionPilatesEDU.com! Touch is the most profound, immediate and direct form of communication. In this workshop a variety of hands on techniques are covered to effectively support the student in getting a deeper understanding of the movements in Pilates and effectively help them improve on and master the exercises. Learn how to use hands on assistance so your client so they can move to the next level. Learn how to use your hands to bring out qualities your student never knew they had. Learn how to spot your client so they find their powerhouse “for real” on the mat. Learn how hands on assistance was done in Romana’s studio at Drago’s Gym. 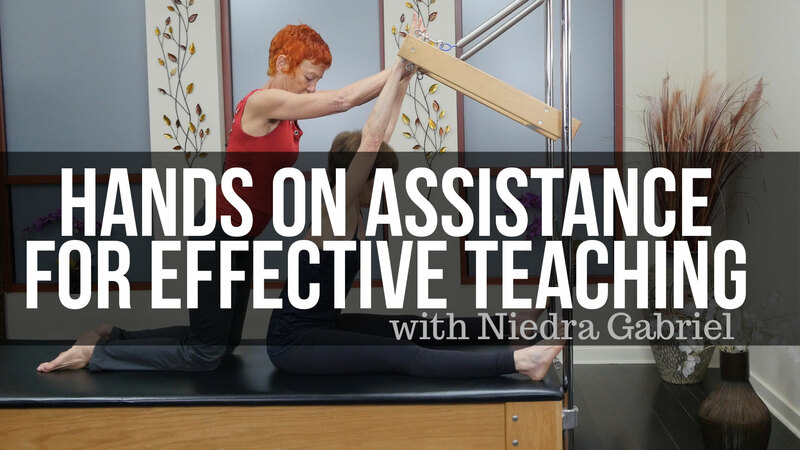 Learn how to Spot your student on the mat, reformer, cadillac, chair and ladder barrel.